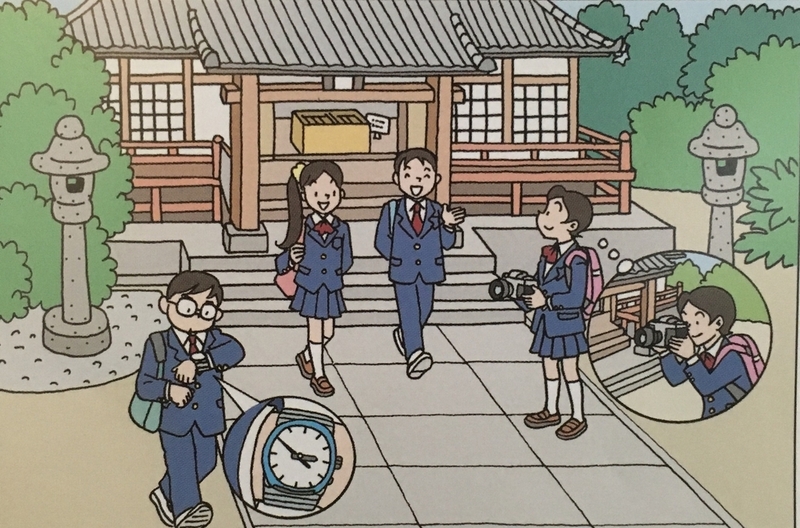 School Trips are popular among Japanese students. Many students visit famous places in Japan, and some students go to other countries. Students travel with their friends and teachers, so they enjoy their school trips. 1. Please look at the passage. Why do students enjoy their school trips? 2. Please look at the picture. What is the boy with glasses is doing ? 3. Please look at the girl with short hair. What is she going to do ? 4. What do you like to do with your friends ? 5. Do you enjoy reading books ? Because they travel with their friends and teachers. He is looking at his watch. She is going to take a picture. I like to play shogi with my friends. Because I like reading mysteries. Because I like listening music better ( than reading ).